Bitcoin Cash led in volatility throughout November: its volatility relative to Bitcoin volatility doubled in the time leading up to the Bitcoin Cash fork. 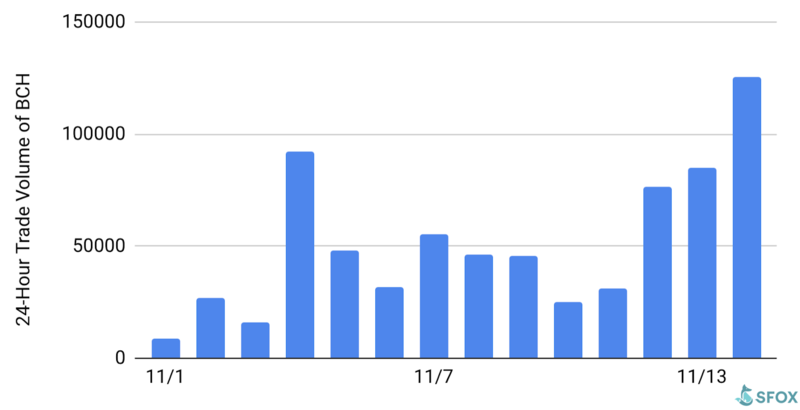 All SFOX-listed cryptoassets rose in absolute volatility over the course of the month, with notable spikes on November 14th, November 19th-20th, and November 28th. All SFOX-enabled cryptoassets – BTC, ETH, BCH, and LTC – were more volatile than the S&P 500 and gold. The three market-wide volatility spikes in November corresponded to: (1) market uncertainty leading up to the November 15 Bitcoin Cash fork, (2) the subsequent hash war between the two blockchains that forked from Bitcoin Cash, (3) the SEC announcing settlements with two major ICOs, and (4) reaffirmations of crypto’s staying power and institutional interest. Look to end-of-year conferences, increased institutional infrastructure, and futures contracts to impact volatility next month. The SFOX research team has aggregated price, volume, and volatility data from seven major exchanges and liquidity providers to analyze the global performance of the four leading cryptoassets – BTC, ETH, BCH, and LTC – that we have enabled on our trading platform. The following is a report and analysis of their volatility throughout November 2018. November saw a run-up in the price of BCH ahead of the November 15th Bitcoin Cash fork, followed by a sharp decline in the prices of BTC, ETH, BCH, and LTC. By contrast, the prices of the S&P 500 and gold (measured by XAU) stayed fairly constant throughout the month. For greater graphical clarity, see this additional chart omitting BTC and the S&P 500 from the data set. 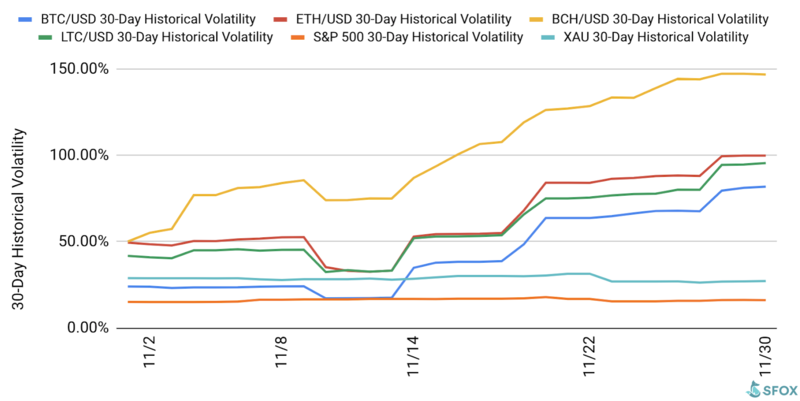 November saw BTC, ETH, BCH, and LTC all steadily increasing in volatility, with the exception of one marketwide dip in the 30-day historical volatility (30-day HV) on the the 10th. ETH, BCH, and LTC were all more volatile than the S&P 500 and gold throughout the entire month. BTC started the month less volatile than gold and more volatile than the S&P 500, becoming more volatile than both of them in the second half of the month. While all crypto volatility increased throughout the month, BCH’s volatility increased by a much higher relative amount. This is evident when we chart the 30-day historical volatilities of ETH, BCH, and LTC as percentages of BTC’s 30-day historical volatility, which can serve as a kind of “crypto volatility index” given that Bitcoin still controls roughly half of the crypto market cap. While ETH and LTC’s 30-day HVs relative to BTC stayed fairly constant ahead of the November 15th Bitcoin Cash fork, BCH’s doubled – meaning that it probably would have only made sense to invest in BCH over BTC if one had expected double-or-better returns from BCH than from BTC. 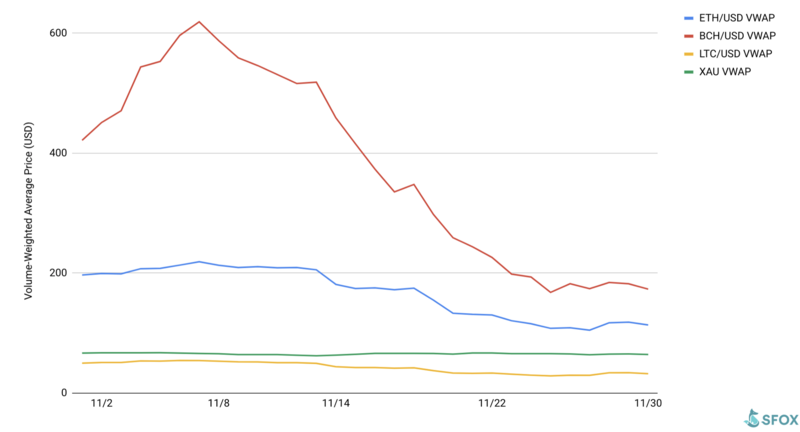 On the other side of the fork, it’s likely that the sharp drop-off in BCH’s relative volatility is at least partially due to exchanges temporarily disabling BCH trading during the ensuing hashwar between BCH and BSV. 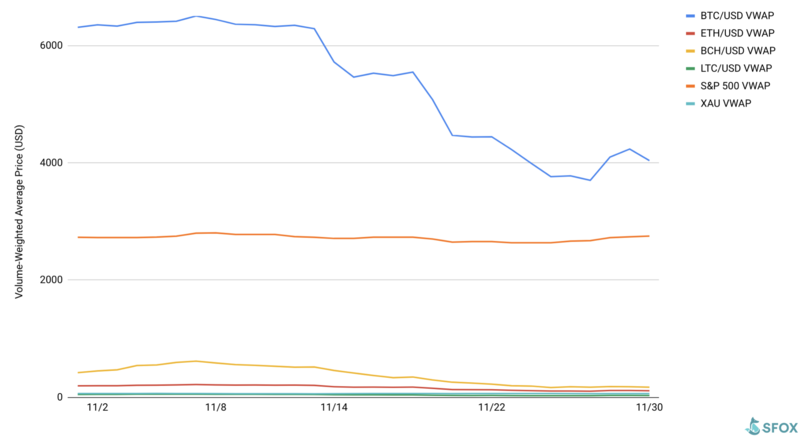 BTC, ETH, BCH, and LTC all saw the same strong upward trend in volatility beginning on November 14th. Once that trend began, it was punctuated by three even larger spikes in volatility: one on November 14th, a second from November 19th through November 20th, and a third on November 28th. 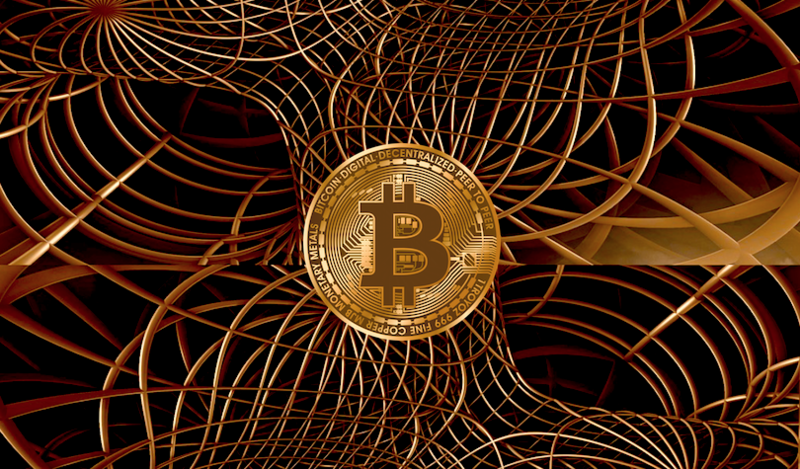 The run-up of crypto volatility in November coincided closely with the hotly anticipated and debated Bitcoin Cash fork, which took place on the 15th and saw the Bitcoin Cash chain forking into Bitcoin Cash ABC (BCH) and Bitcoin SV (BSV). BCH had a daily trade volume of over 125,000 coins on November 14th, showing a clear run-up ahead of the fork. The uncertainty about the outcome of this high-profile fork and the viability of the two chains was a natural recipe for increased crypto volatility – and that uncertainty leading up to the fork remained as a driver of volatility after the fork, during the hashwar in which BCH and BSV competed for common hashpower and the future of both chains was unclear. This spike followed on the heels of the SEC announcing on Friday the 16th that they had reached settlements with two multimillion-dollar 2017 ICOs: Paragon Coin and Airfox. This uncertainty about the future of other ICO-related crypto ventures likely contributed to driving marketwide volatility higher. 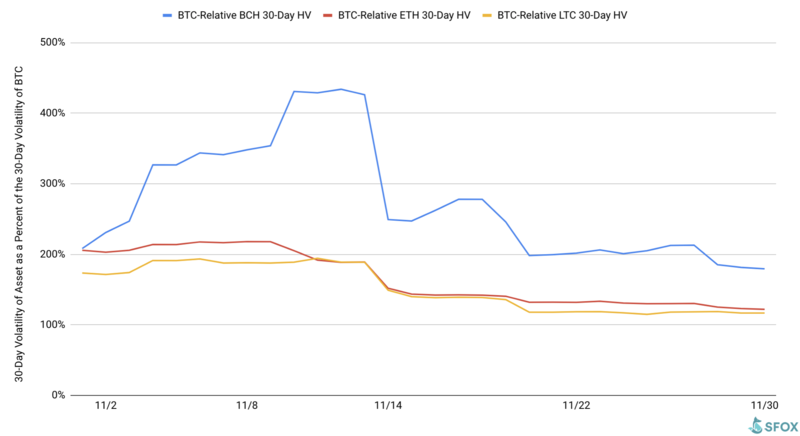 It’s also worth noting that even though the overall crypto market rose in absolute volatility during this timefame, BCH’s 30-day HV relative to BTC’s 30-day HV decreased. That’s probably due to the apparent resolution to the hashwar between BCH and BSV that occurred at this time: on the 20th, about a week into a protracted hashwar, Calvin Ayre, owner of leading BSV supporter CoinGeek, wrote that CoinGeek would “enforce civility” around the permanent splitting of the BCH and BSV blockchains and that nChain (the other major BSV proponent) intended to follow suit. More clarity around the future of BCH reduced uncertainty about the cryptocurrency, which also likely reduced its relative volatility. Crypto market prices began to recover as SEC chairman Jay Clayton reiterated at Consensus: Invest that BTC is not a security and therefore not subject to SEC regulations. NYSE chairman Jeff Sprecher spoke at Consensus: Invest, saying that digital assets such as BTC are “unequivocally” here to stay despite the current bear market. Danny Kim, head of growth at SFOX, also spoke on Yahoo! Finance, emphasizing that “institutions are still actively trading” crypto in the bear market. These reassurances about the longevity of BTC and institutional interest in crypto in the broader context of the current bear market could have stoked overall uncertainty about how much demand for crypto there really is, which could have driven volatility higher. Look to these events as potentially moving the volatility indices of BTC, ETH, BCH, and LTC in the coming month. 12/5/18–12/6/18: FinTech Connect 2018, London. This is the UK’s largest fintech conference and tradeshow, featuring many major players in finance and much crypto-centric content. 12/12/18: Bakkt BTC futures begin trading on the Intercontinental Exchange (ICE). ICE, backed by companies like Starbucks and Microsoft, aims to offer Bakkt as a means of making the trading of cryptoassets more feasible for Wall Street. This could increase crypto’s volatility by adding surplus crypto demand via an influx of institutional investing – an influx we’ve already been observing at SFOX. 12/19/18: CBOE BTC futures expire. Historically, futures expirations have led to an uptick on BTC volatility, both leading up to and following the time of expiration. 12/28/18: Trading of CME and BitMEX BTC futures contracts terminates. As the last major crypto futures expirations of the year, these have the potential to drive the volatility of BTC and other cryptoassets upward. We use two different in-house volatility indices in creating these reports. S&P 500 and XAU data are collected from Yahoo! Finance. The cryptoasset data sources aggregated for the volatility indices presented and analyzed in this report are the following seven global liquidity providers. Different liquidity providers experience widely varying trade volumes. For example, according to CoinMarketCap, Binance saw over $20 billion USD in trading volume over the last month, whereas Bitstamp saw $2 billion USD in trading volume – an order-of-magnitude difference. Therefore, treating any single liquidity provider’s data as representative of the overall market is myopic. Liquidity providers routinely experience interruptions in data collection. For instance, virtually every exchange undergoes regularly scheduled maintenance at one point or another, at which point their order books are unavailable and they therefore have no market data to collect or report. At best, this can prevent analysts from getting a full picture of market performance; at worst, it can make it virtually impossible to build metrics such as historical volatility indices. Building volatility indices that collect real-time data from many distinct liquidity providers mitigates both of these problems: collecting and averaging data from different sources prevents any single source from having an outsized impact on our view of the market, and it also allows us to still have data for analysis even if one or two of those sources experience interruptions. We use five redundant data collection mechanisms for each exchange in order to ensure that our data collection will remain uninterrupted even in the event of multiple failures. In collecting and analyzing volatility data for BCH this month, we constrained our post-fork data to only the Bitcoin Cash ABC chain (BCH) because this is the only BCH fork we have currently enabled on our trading platform. In the future, if we decide to enable BSV on SFOX, then we will also collect and analyze its volatility data.